Halloween may have come and gone, but there are still plenty of opportunities to create a festive fall craft with pumpkins. This year I decorated a small fake pumpkin with colorful fall leafs. Since we don’t get a lot of fall colors here in California, I thought it was a nice way to bring the fall colors into my home. Take your tissue paper and cut out the shapes of leafs: This step was actually a lot harder than I thought it would be! Cutting out thin tissue paper into exact shapes is not easy! I created the leaf shapes by first pulling up images on my iPad and then using a pencil to trace them onto the tissue paper before cutting. Since I am not the handiest with scissors, it helped to already have a guide on the paper. Once you have all your leafs cut, apply a layer of mod podge and assemble them onto the pumpkin once the glue starts to feel a little tacky. Then set the tissue paper to the pumpkin with an additional layer of mod podge. I decided to cover the brown stem of my pumpkin with some gold paint. This made gave my pumpkin a little bit of a glam look. What really brought my pumpkin together was the gold lettering. I just did this by adding some gold stickers from Michael’s. I used more Mod Podge to make sure they really held to the curved surface of the pumpkin. Another option is to paint on the lettering or to cut out letters from paper and Mod Podge them on. You can have your pumpkin say anything. I think a cute option would be to write “Thankful” and then use the pumpkin as some Thanksgiving decor. What have some of your favorite fall crafts been? I recently made these glitter containers from some old burnt out candles! I think that they are a great way to up-recycle and make super pretty last minute gifts! They were very easy to make and add a nice sparkle to any room! The big ones can be used for makeup brushes and the smaller ones can be used for bobby pins of office knick knacks like paper clips. Put your candles in the freezer overnight. This makes the wax less sticky and makes it easier to remove from the canister. With waxed paper or newspaper down to protect your work station, remove the old wax from your candle. To do this use your craft knife to cut around the outside of the candle, then stick the knife into the middle of the candle and twist. The wax should break into smaller sections and be easy to remove. With a microwave safe mug, heat up some water. Pour this into your candle containers and swish it around. If the wick is still sticking, use your craft knife to gently remove your wick from the bottom of the container. Give your container a good wash and peal off the front sign. Then, use your knife or nail to scrape off the bottom label. Use some nail polish remover and a cotton pad to remove any wax residue. Then, give your candle a good scrub and let it dry. Use your craft paintbrush to paint a thin layer of mod podge all over your container. Make sure that there are no big globs of mod podge. Next, pour glitter into the bottom of your glass and swirl it around. To get the sides, tilt the container onto its side and move it in a circular motion. Another way to do this is to tilt the container and pour more glitter in along the sides. Once you have completed glittering your candle, fold your wax paper or news paper and use it like a funnel to pour extra glitter back into the container. If at first there are visible white globs from the mod podge, don’t worry! The mod podge will dry clear. If you have a candle container that already has a pretty pattern on it, just follow steps one through five to remove the wax! Comment bellow and share your own glitter crafts! I made these bracelets while watching a movie with my family over spring break. They are super easy to make and look really cool! I used a strand of rhinestones for most of the bracelets and a strand of metal beads on another one. 58 inches of colored cord. 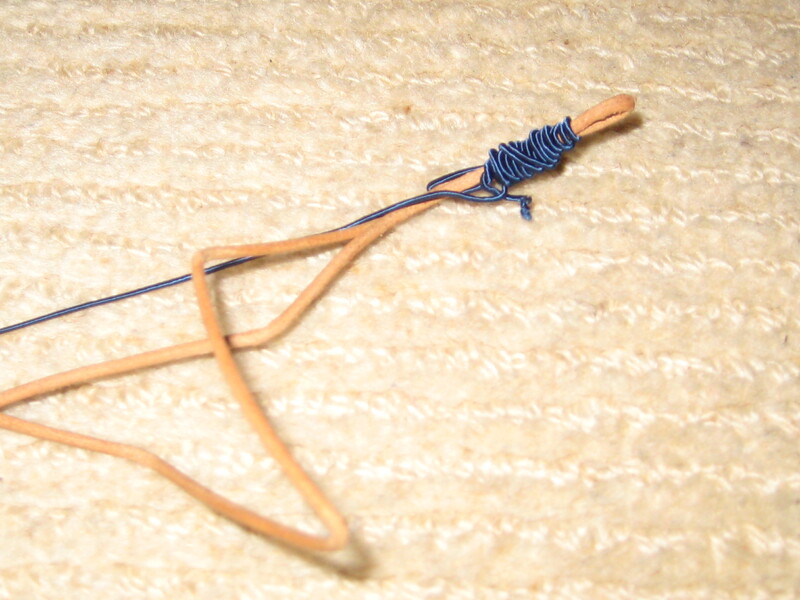 Some places recommend waxed linen cord, but I couldn’t find that at Micheal’s. 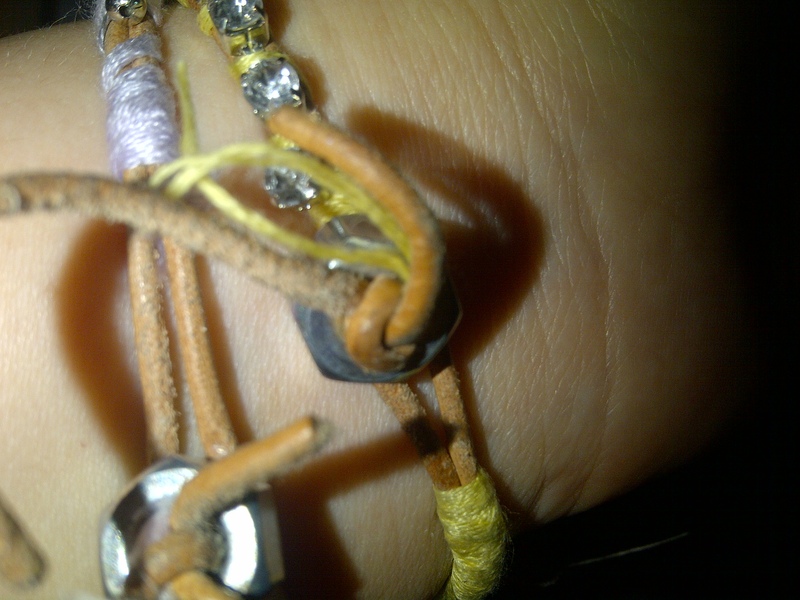 I used plain cotton cord for most of my bracelets and a sturdier cord for some others. 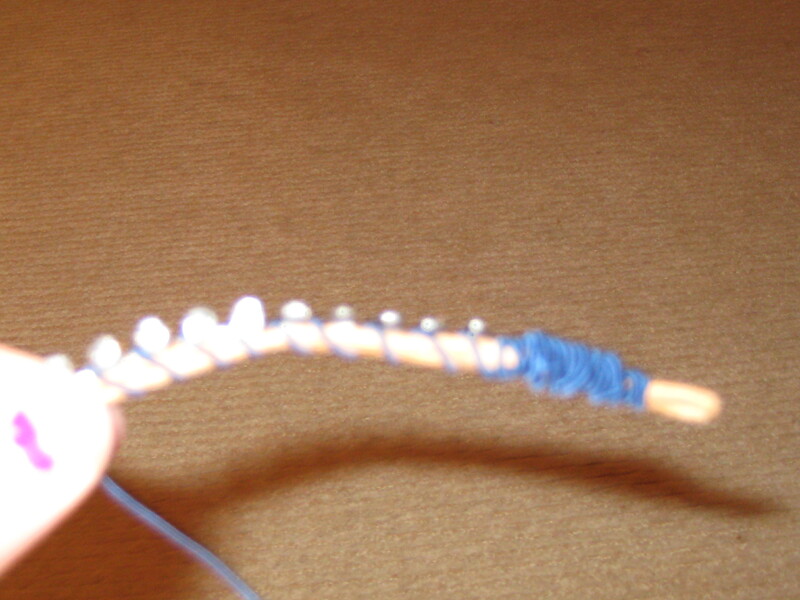 Step 2: Grab your colored cord and wrap it down and back up the top of the leather cord a few times. 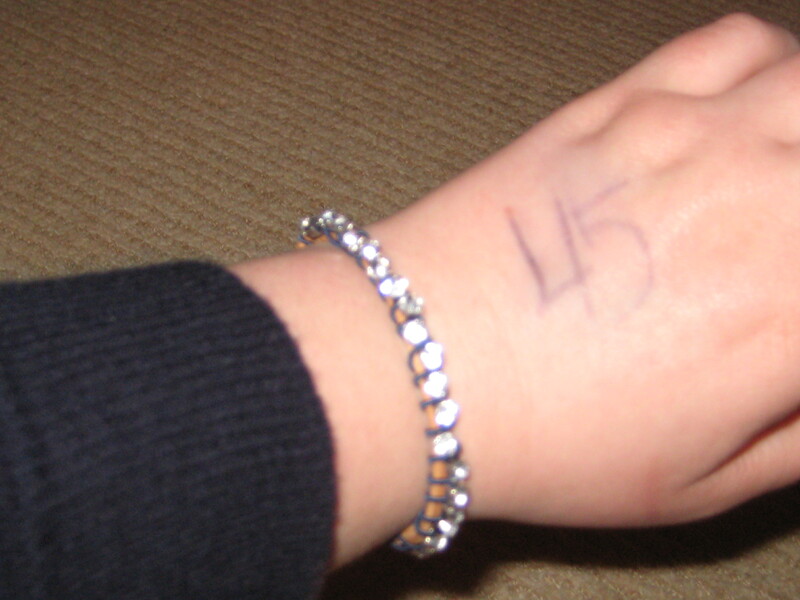 This will make sure that the bracelet does not come undone. 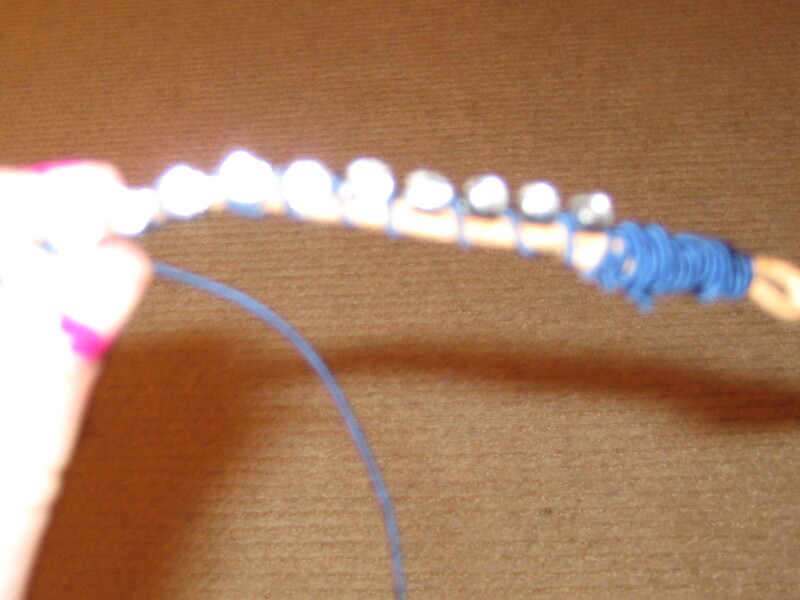 Step 3: Line up the rhinestone cord with the end of the top wrap section. Make sure you make it as close to the end of the wrapped colored cord as possible. You also want to have the crystal kind of over the leather cord. 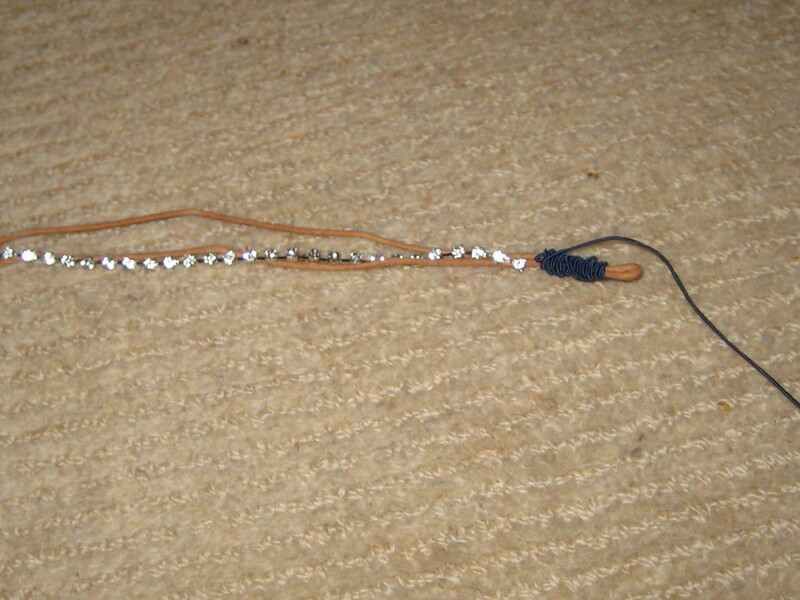 Step 4: While holding the crystal in place so that it falls on top of the folded leather cord, start to wrap the bracelet. Take the colored cord and wrap it between the groves of the crystal chain and around the leather cord. Make sure that you wrap it tightly so that the bracelet won’t come undone. Constantly pull on the colored cord to make sure it is taut before wrapping it. 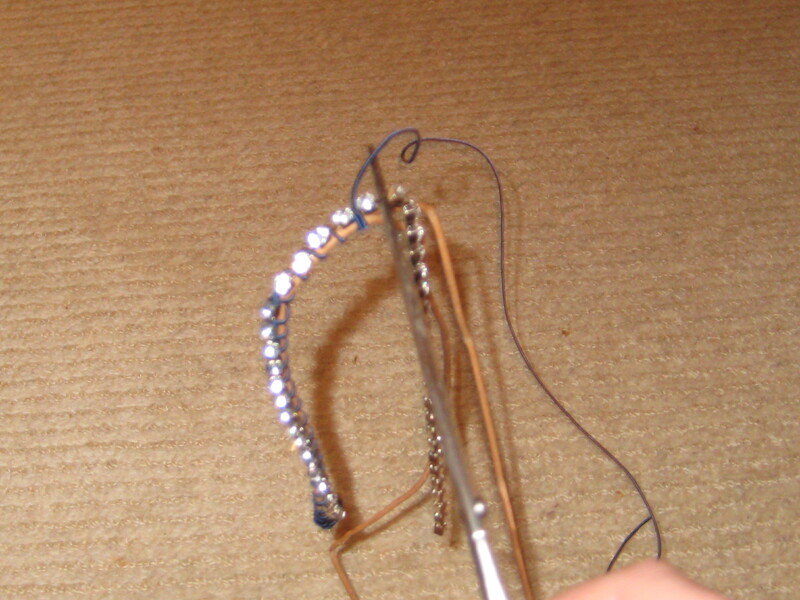 It also help to adjust the rhinestones as you go to make sure that they are staying even along the leather cord. Step 5: Continue with wrapping the bracelet until you get to 1 inch above end of the cords or you measure it to be almost the length of your wrist. Step 6: Cut any left over rhinestones. Step 7: With your rhinestone cord cut, wrap the colored cord down and up the leather cord a few times like you did in step 2. Step 8: Tread your hex nut into the colored and leather cord and tie at the end. Step 9: To wear your bracelet, push the hex nut through the loop that you made with the leather cord at the top of your bracelet. 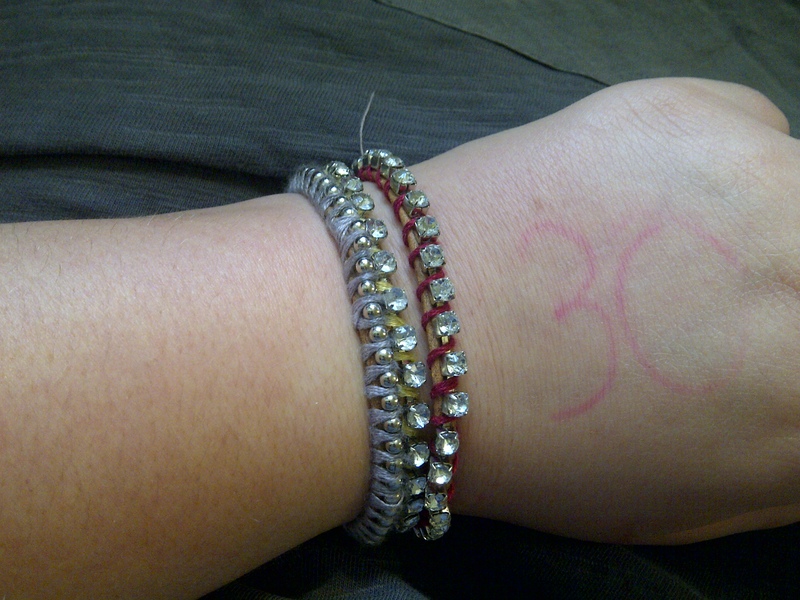 Step 10: Wear your bracelet proudly! Stack them together or wear them on their own to make a fun statement to any outfit! The Ombre trend is everywhere these days- from hair to shirts ombre is making a comeback. A fun way to embrace the trend, if you don’t want to make the more committed change to your locks or spend money on an expensive blouse, is to dye tights in a gradient, ombre style. I tried ombre tights this weekend. I used purple (one of my favorite colors to wear) and petal pink (for a springtime pastel look) dye. To start, grab some white tights and some dye. I like using the RIT band of dye. Soak your tights in warm water to make them more absorbent. Then follow the instructions on the dye package. 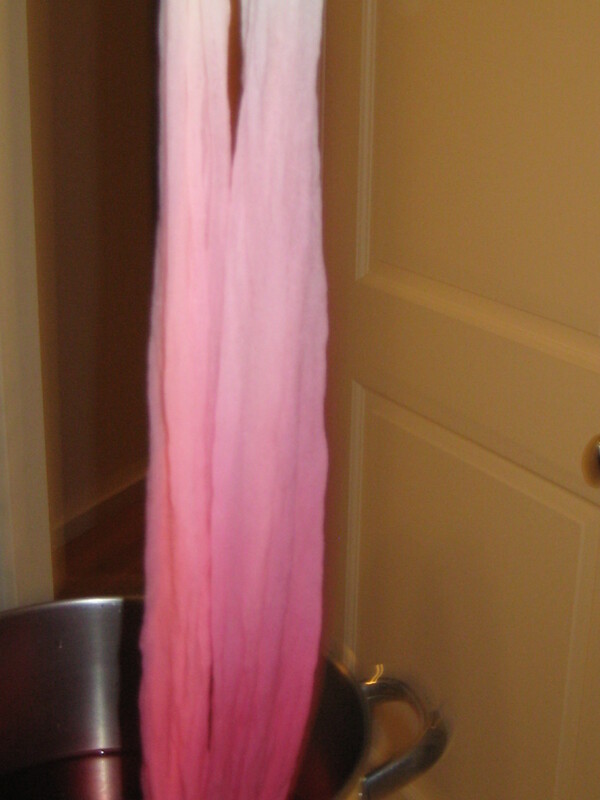 When dying the tights, only dunk the top part in for a little while, then gradually pull the tights out of the dye bath. Be sure you keep the ankles and feet in for the longest time to obtain optimal color and effect. It helps to use the timer on your phone. Then hang your tights to dry. 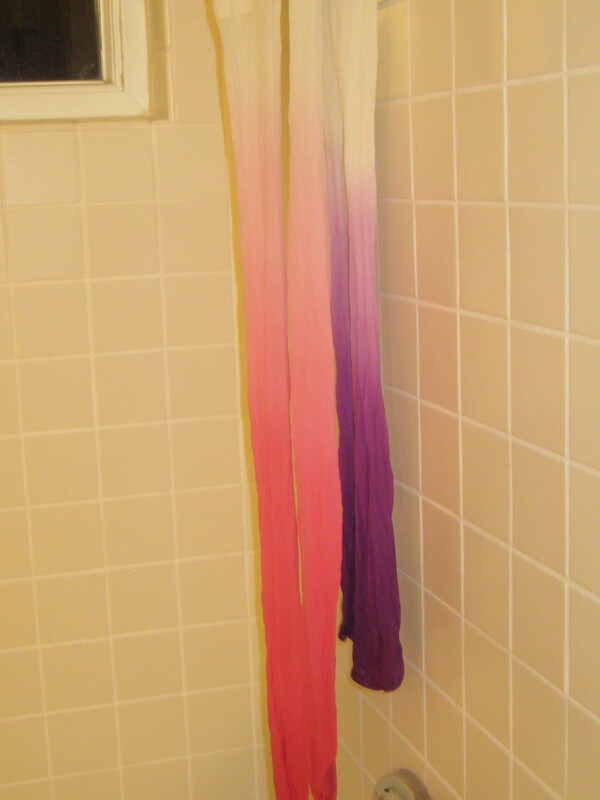 Just by hanging them some dye will fall into the bottom of the tights, increasing the ombre look. 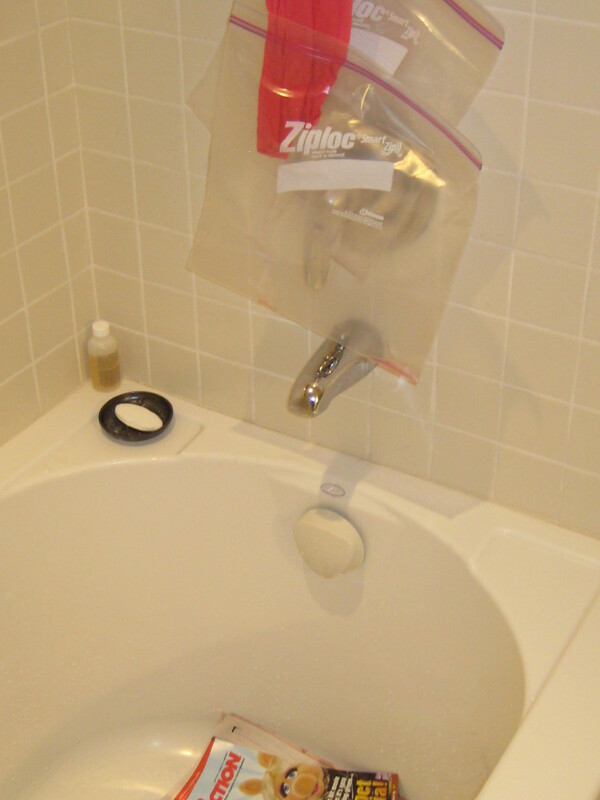 To protect the tub, I put ziplock bags on the toes of the tights to catch any leaking dye. I also placed newspaper in the tub to absorb any escaped dye. Once the tights have dried, rinse them in warm water until the water runs clear. This will ensure that no color comes off while you’re wearing the tights or in the wash. Overall, I would say that this project took some time and was a little tedious, but pretty easy to complete. After seeing the finished product I wish I had dyed my tights just a little bit darker because the colors got a little washed out at the tights stretched. What do you think? How will you embrace the ombre trend? Leave a comment bellow!